:: Sponsored by: Rocky Neck Art Colony, Fuller Craft Museum, Maud Morgan Arts Chandler Gallery, Holliston Mill Artists, Waltham Mills Open Studios, Solomon's Collection and Fine Rugs, Vizivel, North Bennet Street School, Norman Rockwell Museum, Fenway Open Studios, and the Artscope Tablet Edition. This week we're presenting Thayer Gallery, de Menil Gallery, and Nesto Gallery, showcasing the incredible works of school art galleries. There are also other interesting and exciting events happening soon for those who want more. 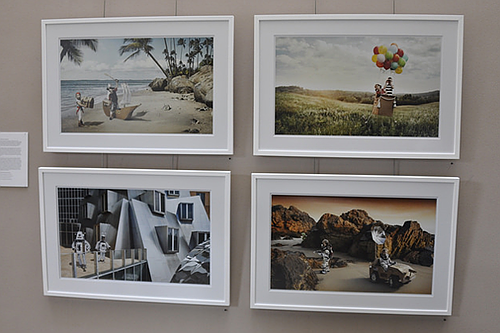 "Tipping Point: Changing Paradigms" is on view at Thayer Academy's Thayer Art Gallery from now until November 9. The exhibition features the art of Elemental, an all-female art collective made up of Debra Claffey, Patricia Gerkin, Donna Hamil Talman, and Charyl Weissbach. 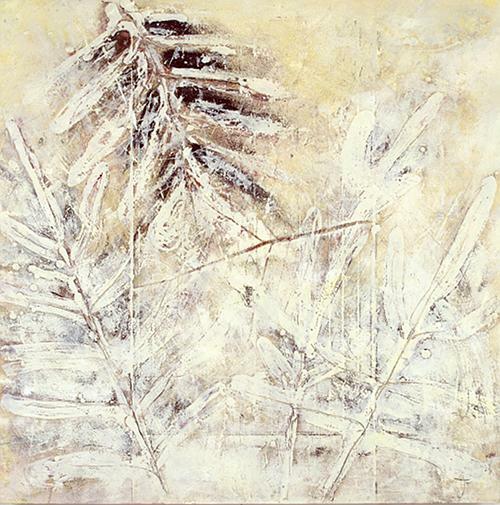 Each artist uses encaustic wax and mixed media to convey the connection between all living things and humanity's responsibility to help our planet. As Debra Claffey says, "We must begin to restore the balance in the relationship of Human to Nature. My daily reminder is that plants and trees are intelligent beings that we have disrespected in so many ways, and we must find ways to reconnect." All four artists are driven by a commitment to nature and balance. "Tipping Point: Changing Paradigms" represents both a lamentation on the current state of the natural world and a call to action to create a better future. There will be a reception for "Tipping Point: Changing Paradigms" tonight from 6:00 p.m.⎻8:00 p.m. Thayer Art Gallery is located at 745 Washington Street in Braintree, Massachusetts and is open Monday⎻Friday 8:00 a.m.⎻3:00 p.m. when school is in session. For more information, please visit thayer.org/thayer-art-gallery. Sponsored by: Rocky Neck Art Colony, Fuller Craft Museum, Maud Morgan Arts Chandler Gallery, Holliston Mill Artists, Waltham Mills Open Studios, Solomon's Collection and Fine Rugs, Vizivel, North Bennet Street School, Norman Rockwell Museum, Fenway Open Studios, and the Artscope Tablet Edition. Little Red House on Clarendon Street, oil by Stephen LaPierre. * Visit the Rocky Neck Art Colony in Gloucester, MA. 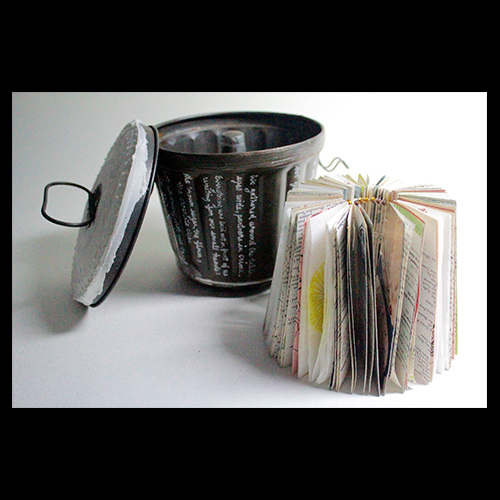 * October 26, 7:00 p.m.: Closing conversation with Iranian Artist Azita Moradkhani, RNAC Residency Studio. Context: Language, Media, and Meaning from the Surface Design Association explores traditional, non-traditional, and contemporary practices of incorporating written language in textile-inspired art and design. Juried by Bruce D. Hoffman. Reception: Saturday, October 27, 2018, 3:30 p.m.⎻5:00 p.m., at Fuller Craft Museum, 455 Oak Street, Brockton, MA, 02301. Reception: Thursday, November 8, 6:00 p.m.⎻8:00 p.m.
First, picture the human body. Then, as if a camera were zooming in closer, go through all layers of skin, muscle, and bone right down to the tiniest molecule. What once appeared simple has a new level of complexity, of many small parts working together on a larger scale. 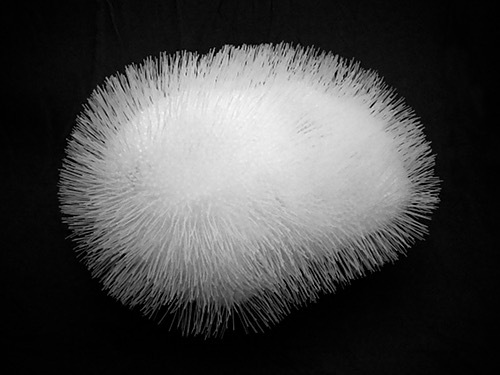 That describes both the intricacy of molecular/cellular biology and the work of Cindy Lu, whose background in the subjects inform her artistic style in many ways, most recently in her upcoming show at the Chandler Gallery, "Data Collection." "In this age of big data and artificial intelligence, we are continually subjected to digital biopsy to feed the growth of entities that seek to monetize and control our behavior," she explained. 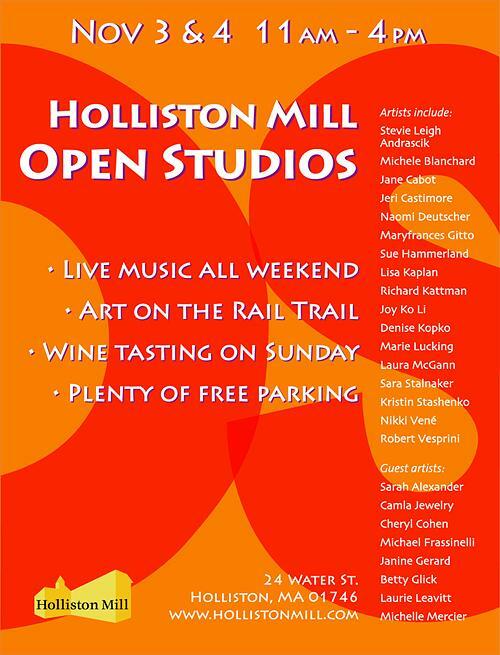 Artists at the Holliston Mill will host their annual Open Studios event on Saturday and Sunday, November 3 and 4, from 11:00 a.m.⎻4:00 p.m. each day. 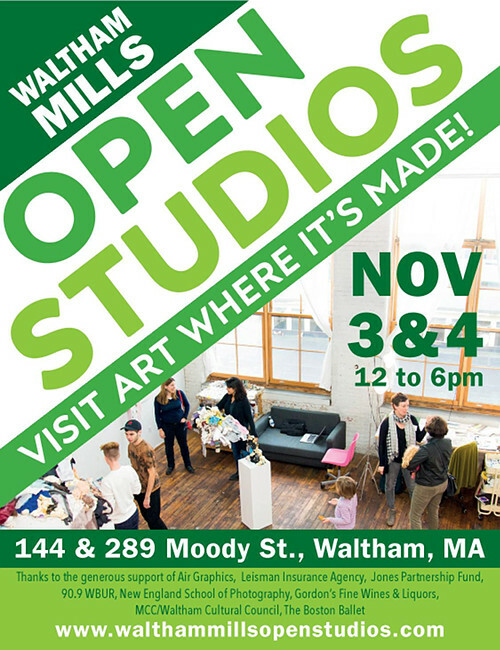 Artists participating in the open studios include resident artists, as well as local guest or former resident artists. The artists ply their crafts in a multitude of media including: oil, acrylic and watercolor paints, sculpture and mixed media pieces, photography and digital media, drawing, printing, jewelry and textiles. The Holliston Mill building, an 1800's shoe factory, is located at 24 Water St. 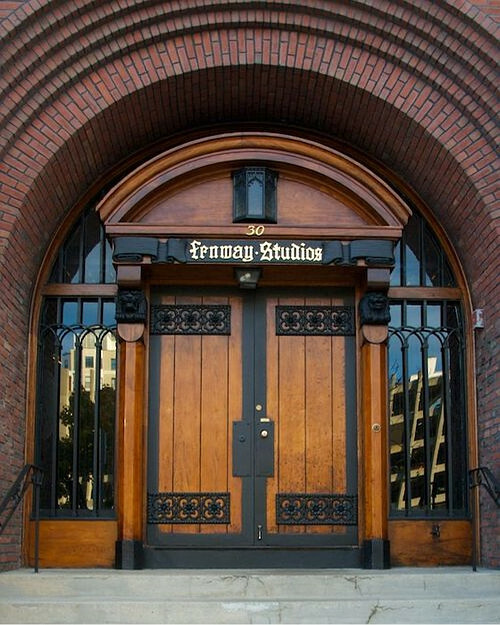 Currently, the mill is home to several small businesses as well as artists' studios. The structure remains largely as originally designed. For more information visit the website: www.hollistonmill.com, 'like' the Holliston Mill Facebook page, or follow us on Twitter or Instagram. The event is free and open to the public. The historic building is not wheelchair accessible. 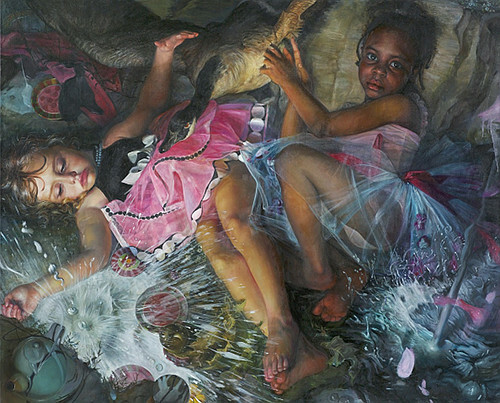 Margaret Bowland, The Tea Party from the series "Babes in The Woods." 2013, oil on linen, 64 x 78 inches. From now until November 9, Groton School's de Menil Gallery is showing "It Ain't Necessarily So." This solo exhibition features the work of painter Margaret Bowland, who creates realistic, detailed portraits of costumed or made-up women and girls. Bowland demonstrates how much women must change themselves in order to be conventionally attractive and appeal to others. At the same time, women try to express themselves through the makeup and costumes. The same is true of the women in Bowland's pieces. As she says, "My subjects triumph. They look back at you through all the make-up, the costumes, the times in history in which they are placed, completely whole." Despite the standards foisted on them by society, the women stay true to themselves and their own strength. Their piercing gazes remind the viewer that beauty doesn't have to be everything. The de Menil Gallery is located at 282 Farmers Row in Groton, Massachusetts and is open Monday and Tuesday 9:00 a.m.⎻3:00 p.m., Thursday and Friday 9:00 a.m.⎻3:00 p.m., and Saturday and Sunday 11:00 a.m.⎻4:00 p.m., excepting school holidays. For more information, please visit groton.org/the-de-menil-gallery. Milton Academy's Nesto Gallery is showing "Practice What you Teach" until November 16. This mixed-media, multi-artist exhibition honors the late Kay Herzog, former chair of the English Department at Milton Academy and champion of the arts. Herzog co-created both Senior Spring Projects and the Arts Program, among her many other achievements during her tenure at Milton Academy. The exhibition features the paintings, sculptures, and other works of numerous faculty and student artists. 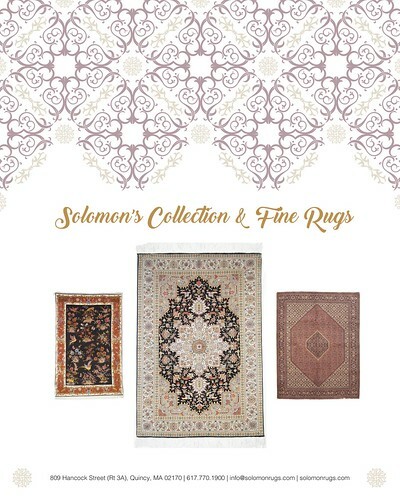 Each piece showcases the talent and skill of its artist and honors Herzog through its beauty. There will be a reception for "Practice What you Teach on November 13 from 6:00 p.m.⎻9:00 p.m. featuring a lecture from renowned art critic Jed Perl. 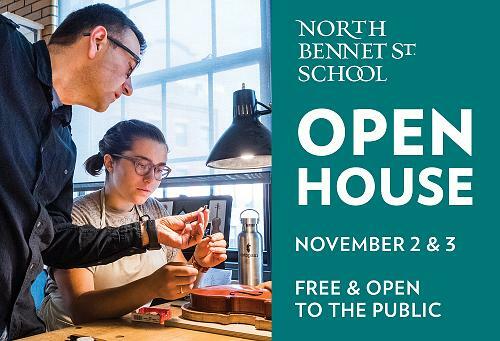 Nesto Gallery is located at 170 Centre Street in Milton, Massachusetts and is open Monday-Friday 8:30 a.m.⎻3:30 p.m. during the academic year. For more information, please visit milton.edu/arts/nesto-gallery. Final days! Keepers of the Flame: Parrish, Wyeth, Rockwell and the Narrative Tradition. "Simply stunning!" 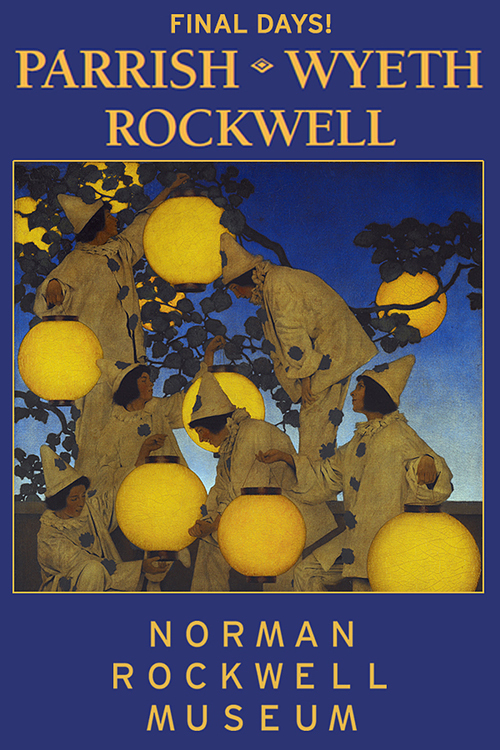 This exhibition features the work of master illustrators Maxfield Parrish, N.C. Wyeth, and Norman Rockwell; with more than 60 works by 25 American and European painters and 300 digital representations of some 50 other artists.